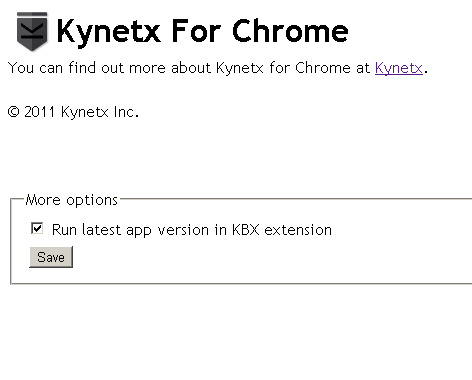 I decided to have a quick look at the Kynetx KBX Chrome extension and see if I could patch it so I wouldn’t need to deploy an app everytime I modify it when it runs with the KBX extension ( http://stackoverflow.com/questions/5653090/kynetx-app-not-working-when-installed-via-kbx-extension-on-chrome ). 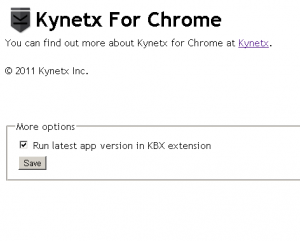 This feature can be enabled/disabled in the options page of the extension. It is enabled by default. A Firefox version might follow when I’ll start debugging on FF. There doesn’t seem to be a preferences screen so this feature cannot be disabled unless you set the variable run_latest_app_version_in_kbx to false in page_interaction.js. Modifications in the file are taken into account immediately, no restart or disactivation/activation needed.